Twitter is an amazing place. 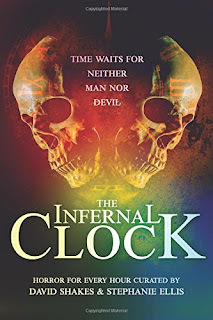 Yes, there’s a lot of bitching, trolling, gossip and nastiness in the timelines these days but it can also produce brilliance like The Infernal Clock anthology. I’m lucky enough to follow a few of the contributors on Twitter, as well as co-curator David Shakes, and I watched with interest as the idea coalesced from vague musings to a firm plan and, now, to solid form as a book as magnificent authors bought into the idea put before them and came together to give their stories to fill the hours of a single day with horror. With 24 stories, as well as a prologue and epilogue, there’s something for every kind of horror fan from ghostly tales and psychological thrillers to full on body-horror gore. I loved the fact that the only thread running throughout was the passage of time, there was no attempt to carry a character or location from one story to the next which could have felt forced, and I was very impressed by how different each story was, both in subject and in style. Subject-wise there is a good mix of fantasy and reality – and a surprising amount of work related settings throughout the daytime hours! I wonder if that says something about the collective psyche? It was good to see modern vernacular sit side by side with classical, almost poetic, prose too and there was a lot of dark humour evident in the tellings. Style-wise the stories had a great variety, some first person, some third and some, like the astonishing The Watchman from Mark A King, in the second person, a style which, to my mind, should be used a lot more in horror as I find it wonderfully unsettling. There are stories written almost as short vignettes – I loved the richness of description in Sean Fraser’s titular tale The Infernal Clock - and diaries, like Chris Milam’s The Eternal Goodnight. Then, at the other extreme, you get a full on stream of consciousness at the mid-day hour from the redoubtable James Knight. Difficult to read, with no punctuation or capitals, if you’re not used to his work (I am already a huge fan) but it is bloody glorious and very much worth the effort. However my favourite story, if you’re forcing me to pick one, is the one set at 11pm from A J Walker. The level of tension and the “reality” of the situation really hit home and it’s a story that has stuck with me since I read it. One final thing I must commend is the actual layout of the book. Each story occupies an hour and gets a title page with not only the hour’s roman numeral, reminiscent of a mantel clock, but also a superb quote from classical literature that manages to both sum up and tease each story perfectly – something I didn’t think was possible. Whoever is responsible for choosing these deserves huge applause. If you are a fan of horror writing at all, you need to buy this book. At the very least you will find a tale to suit you but, more likely, you will discover (or rediscover) remarkable authors with amazing new ideas to while away a lot more than just one hour with.